Dr. Syntax: A Christmas Poem: Thomas Hardy's "The Oxen"
A Christmas Poem: Thomas Hardy's "The Oxen"
One more poem for the Christmas break. Thomas Hardy's "The Oxen" was first published on Christmas Eve, 1915. 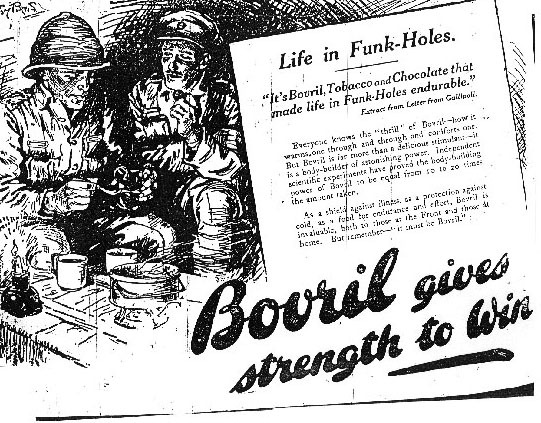 It was printed in the Times of London, cheek by jowl with news of the horrific conflict that was ravaging Europe; nearby was the advertisement shown below, touting Bovril as the tonic for men in the trenches. The second line refers to the folk belief that farm animals kneel at midnight on Christmas Eve. I have always loved the understatement of this poem, which seems even more poignant in a time when "holiday mix" blares from the speakers in every mall (and war is still ravaging). There's an interesting article at The Victorian Web about the poem and its context (including the ad, with its "sacramental" portrayal of Bovril). When I first saw the article, I thought I didn't have to read it. But I'm so glad I did. Very interesting stuff. As the tradition holds on this side of the ocean, cattle kneal on the eve of Old Christmas (January 6), btw. One variation of the belief includes the brief (at midnight, if I recall) ability of animals to talk. P.S. A nice documentation of an early use of "funk" (in the add). Thanks! Oh shoot. I thought I might add that the "farm animals" (or meek creatures) that kneal do so because these were the same animals in the manger who witnessed the original birth. Anita, thanks for your comment. Glad you enjoyed the article. GhostFolk, you're right about why the farm animals are believed to kneel. I didn't know that there was a tradition saying they knelt on January 6th, though! They must be meticulous record keepers to distinguish Old from New Christmas. Thanks for a graceful way to share a beautiful, sadly ever-timely, Christmas poem by one of my favorites. Peace to you this season.